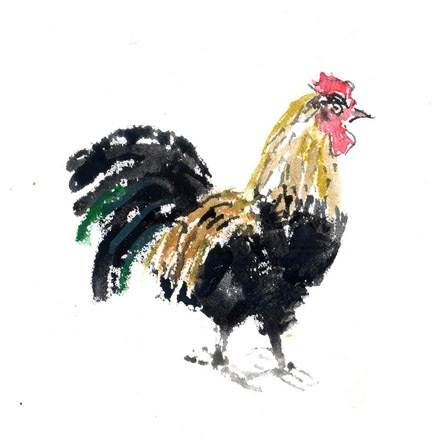 The latest product from Turtle Hill Farm is a line of hand-painted cards featuring some of the residents, namely, the beautiful roosters. I like working in this fresh style which is an oriental approach to art, with deftness of brushwork being an important feature; it is not realistic, yet, it captures the essence of the subject. And I would say, the personality! These works are done on the spot… with a live bird standing in front of me, not from photos. I’ve nothing against working from photos, but these are meditations, and the spontaneous, in-the-now making of the art is the most important part. If you want to own a little piece of Turtle Hill, and an original work of art, you can buy cards at my Etsy shop! Even the somewhat docile Silver Gray Dorking gets spring fever. I have several males who were living together as bachelor brothers, but when the days started getting warmer, they started to fight, and I ended up having to separate all of them. This one was in with some nice females, adjacent to another pen with another rooster and hens. Unfortunately, the more uppity roo found a way to break through a spliced section of chicken wire, and when I got home I found this poor fellow hiding under a bush, bloody and bruised, but not mortally wounded. I took him in the house, of course, washed his wounds, gave him arnica homeopathic remedy (which I find very effective in injuries for people and animals) and kept him quiet in the bathroom with the door closed. In a case like this, the priority is to attend to the wounds first, then try and de-stress the bird with a quiet, comfortable place. His spirit seemed so broken! He sat there and would not eat for half a day or so. Then I realized I had a nice way to perk him up a little, with one of the winter “chicks”… now in the pullet (older teen, young adult stage). They were still with their mother, old Eleanor. He started to come back to life very quickly with a cute little female around. She started in on the food immediately, and he started to eat and drink again. Below you can see the size difference between the two. Social isolation is not a good thing, for flock creatures like chickens. Nor for humans! Here’s a cute example of the immune-boosting power of socializing with good company! 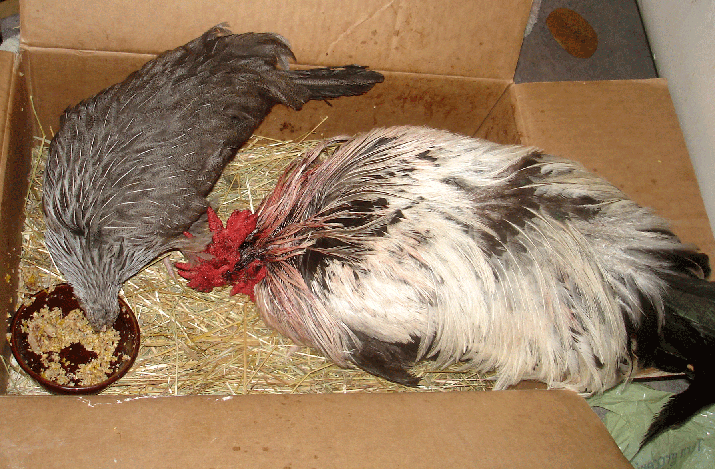 For those who like to know how a story turns out, the rooster (Eleazor) fully recovered within a day or so of companionable living, and is now back with his own flock of “girls.” He is the sire of a new line of Dorkings who are still in egg form, but are being delivered to incubators and broody hens all over the province this spring and summer. His wee Florence Nightingale is leaving Turtle Hill Farm this very day, to start a new flock of Dorkings on a new farm, with her sister and another young rooster. The chicks Eleanor hatched in December are growing up, but here is a picture of them at a few days old. She never seems to tire of mothering. Last year I obtained a few Silver Gray Dorkings. This heritage breed is endangered–as are many of the older breeds–by a monopoly of meat kings, and brown and white layers. At any rate, they are beautiful, and are very good egg layers. They also are willing mothers, as Eleanor has proved now for the second time. She hatched four chicks and I had two hatch in the incubator the previous week. I wanted to put the incubator chicks with the mother, but was concerned they would not recognize her as their mother, having spent a week under a heating lamp in my house, and bonding to me. At first they were hesitant, but within half a day were resonding to her clucks to come and eat or follow her into their house. So the coding in the wee brain of the chick is set to recognize the mother hen even if introduced later. I wonder at what point they would not respond? At any rate all is well, and Eleanor is doing a great job. She is exceedingly tolerant and patient with them, even when they tug at her eyelids or ears (one chick does this at one point in the Facebook Turtle Hill Farm film clip on the topic). They are housed in an A-frame style coop with attached run. It has no bottom, and can be moved every day to fresh grass, so the “floor” is always clean, and they eat a lot of fresh grass and insects. The sleeping part does have a bottom and a door, to keep them warm and protect from predators at night. I stapled plastic sheeting to the run part to protect them from rain and drafts; they are fragile to cold, and Nova Scotia can be chilly in Spring.